Just thought I'd share some random details and events. 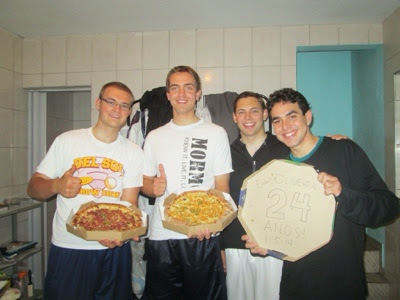 Elder Oliveira'a first name is Pahoran. He was born in the covenant, but his parents divorced when he was one and every one left the church. It was until he started to investigate the church when he was 18 that he found out that his name was from the Book of Mormon. His dad has since came back, but his mom is still inactive. 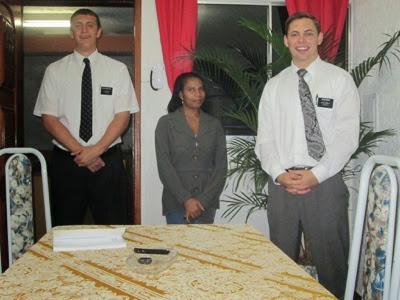 I told this story to you in Portuguese so I will re-tell it: Elder Shaw had a very eventful baptism this Saturday. First of all the guy he baptized looks like he is from an 80's hair rock band. Second, he had our cell phone in his pocket when he entered the font. Third, they filled the font too high and when he baptized the guy water spilled over into the room, baptizing my shoes as I stood as one of the witnesses. Fourth, a random lady walked in right before the baptism and asked how she can learn more about the church and become a member. She lives in our area so we invited her to attend the baptism and went by her house to teach her the next day. She's great, but isn't legally married and smokes so we have some work to do. I think that's about it. I would just like to make an official apology to the world for all of my negitivity towards Elder Shaw. I have lived with him for more than three months now here in Cocaia with a little more perspective under my belt I can say that he definitely did not deserve everything I said about him. It was an attitude failure on my part. I'm not saying I'm itching to be his companion again, I'm just saying that he really is a great guy with a great heart.